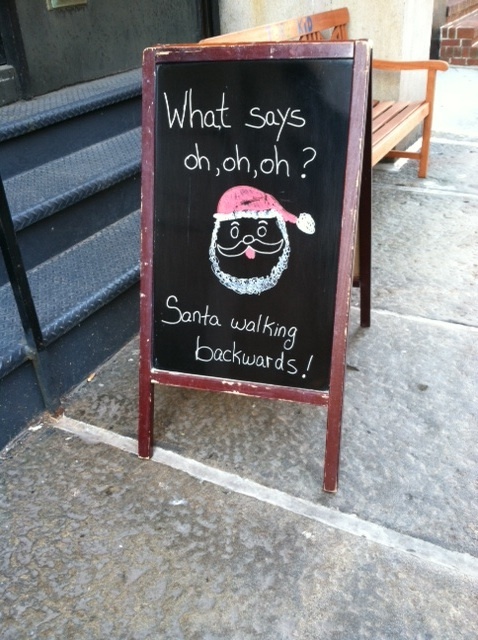 The signs of the holiday season are everywhere these days. 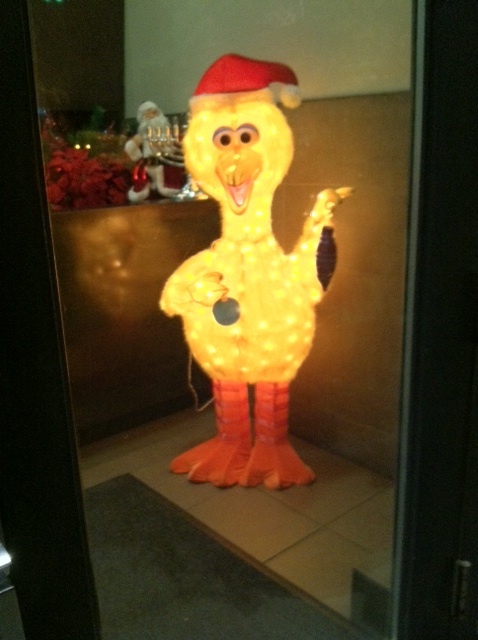 Big Bird multitasking as holiday eyesore. The other night I was walking east on Houston Street with my pal, Coco. 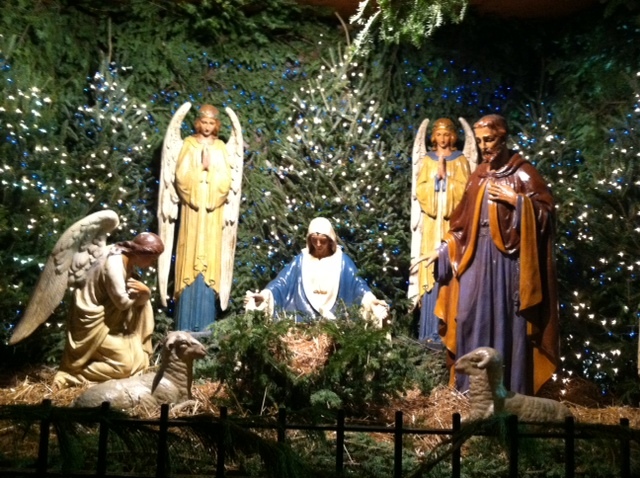 We paused to observe the elaborate manger scene inside the gates of St. Anthony’s church when I nearly suffered a coronary. Me: Coco, look! Jesus is missing! Is nothing sacred? Who steals Jesus? Where’s the life of the party? Coco: LBJ isn’t there because he doesn’t come out until Christmas Eve! We don’t have to get all CSI or re-enact the Lindbergh baby kidnapping! To emphasize her point, to make me feel like the consummate stupido, Coco stabbed her studded, black leather-gloved finger at potential suspects. Or you? Did you take LBJ? I could not get my mind off Lyndon Baines Johnson. Me: What has the 36th president got to do with this? 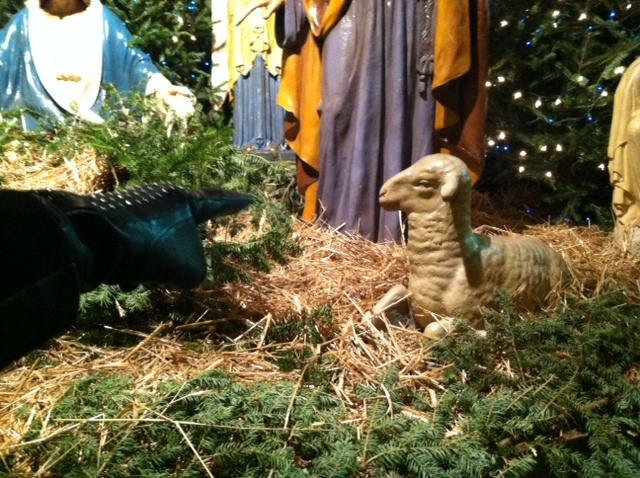 Coco: LBJ is Little Baby Jesus you dumb bell! It was enlightening to learn that my friend leads a double life as the female Jay-Z. After Coco and I parted ways, I went home to the Upper West Side, where I saw another holiday display, this one in the window of the Citarella market on Broadway. 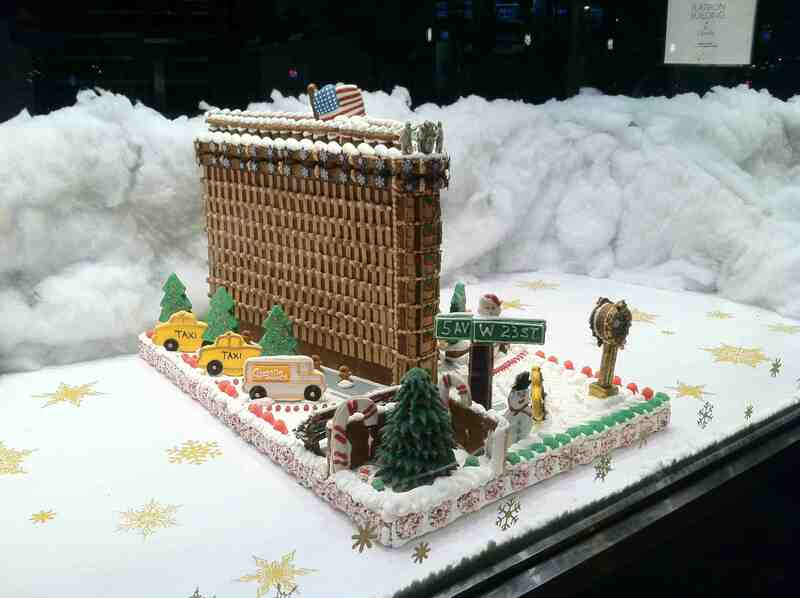 It’s an edible replica of the Flat Iron building, their contribution to the Gingerbread Extravaganza. This might not taste as good as it looks. This extravaganza is for a charitable cause, City Harvest, an institution that helps fight hunger in New York. To see all of the gingerbread structures in competition click here. When I was growing up in San Francisco, a sure sign that Christmas was coming was when my mother would drag me with her to the Emporium, our go-to department store. Every year, a section of the store would be devoted to their made-to-order holiday cards. The cards were displayed under cellophane in thick oversized books that my mother would scrutinize for hours. If in reality we were only there twenty minutes, I was so bored it seemed to last an eternity. My mother, a perfectionist who was always more high strung than usual during the holiday season, would make mincemeat out of me if I dared touch one of those books. Those books were for adult scrutiny only and about as thrilling as math class. All of those cards were capital d Dull. The card my mother would select was always a variation of the same theme: a somber nativity scene. Snore. When the cards arrived, Mom would spend hours at the kitchen table working on them, addressing each envelope in her perfect, flowery script. She would write thoughtful notes inside. Eventually, she cut herself a break in this masochism and stopped licking each stamp personally and began utilizing a sponge. It amazed me that she would send out hundreds of cards. My parents seldom ever had friends over. Who was she sending all of these cards to? Pages of random people in the phone book? I never asked. I knew that when she was in Christmas card mode to stay far away. If I could have moved to Mars I would have done so. My salesman father would send cards to his customers. He’d be on the road filling his car with gas, notice cards on sale next to the motor oil and pick up whatever the grease monkeys were selling. This probably took him a total of six minutes and he even got his windshield washed. When my dad did his cards, at warp speed at his desk in the room he shared with my mom, I was allowed entry. I could light myself on fire, run in circles and scream at the top of my lungs. In 1970, he came home with a card with a picture of a moose that had a red and white candy cane protruding from its mouth. 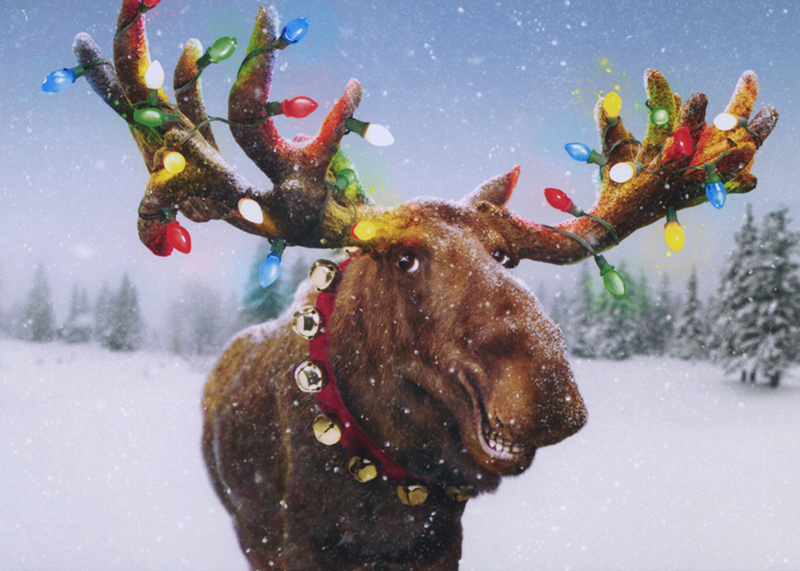 Inside it announced, “Merry Christmoose!” I thought that was the greatest holiday card ever. Granted, I was only eleven, but I had never known there could be a funny Christmas card. When we received a card from someone that did not make my mother’s list, she had a meltdown. She had given out all of her made-to-order cards. My father had some extra Merry Christmoose cards. He offered his to her. 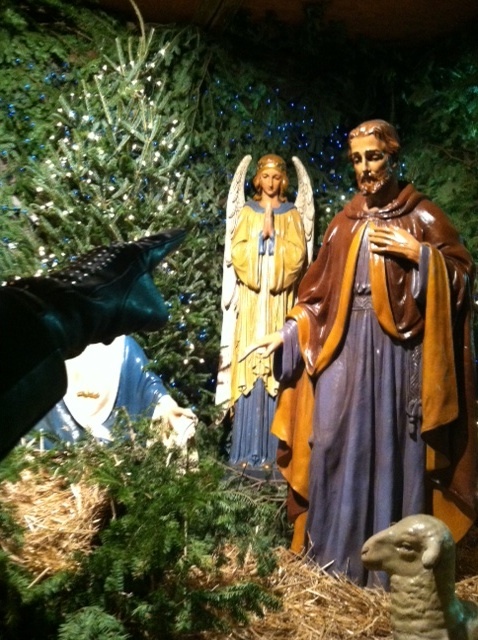 The expression on my mother’s face was as if he suggested she write “Merry Christmas” on a dead seagull. She went out and bought a card. This year is the first time in thirty years that I have not sent holiday cards. Milton wanted me to design my own, but I didn’t get around to it. When I visited a card shop in my neighborhood, I immediately noticed one I would have sent. Unfortunately, this card was not available in a multi-pack. But I did send one to my dad.